In 1925 Portals, the owners of Stowford Paper Mill, were awarded the contract for the supply of postage stamp paper by the General Post Office. It seems from this date onward, two of their mills, Roughway Paper Mill and Stowford at Ivybridge, were active in the production of postage stamps. On 29 December 1925, production records for Paper Machine No.2 at Stowford Paper Mill document a making of watermarked stamp. A total of 25 reels of Royal Cypher watermarked paper were produced at a width of 17¾”, amounting to 13,390 lbs. The paper machine reels were made at a deckle of 65¼” with the order taking a total of 34½ hours to complete. This was shortly followed by another production run on 31 December with a further 66 reels, 34,031 lbs taking 97 hours to manufacture. Records reveal that this was valuable business to the mill, as no production had been recorded on Paper Machine 2 from 10 October 1925 until this production run at the end of the year. It was a bad time generally within the paper industry and the employees at Ivybridge had been on ‘short time’ working arrangements. The orders for Royal Cypher stamp paper in 1926 reached over 500 tons, representing around one third of the total production of 1550 tonnes on paper machine number 2. This all contributed to better working conditions and the employees were generally thankful to Portals for bringing this new business to the mill. In 1930, when Wiggins Teape took over both Stowford Mill and Roughways Mill, the decision was made to transfer all postage stamp paper to Ivybridge, with Roughways Mill turning to the production of wrapping papers. Stowford Mill continued to manufacture watermarked stamp base for the next 43 years, using a number of different watermarks. 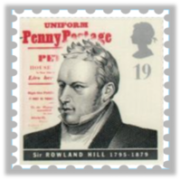 In 1840, Sir Rowland Hill introduced a single uniform postal rate of one penny, regardless of distance for a standard-weight letter across the British Isles. The first postage stamp to be printed in the world was the famous “Penny Black” issued on May 6, 1840. Stamps, historically, have been produced on watermarked paper. In 1847 the watermark was ‘VR’ (Victoria Regina – latin for Queen Victoria). The watermark changed for the last time in 1958. The Tudor crown watermark had been replaced because the dandy roll was worn, and the St. Edward’s Crown watermark was now replaced because of the introduction of Scottish regional issues and perceived sensitivities as Elizabeth is the first Elizabeth to rule Scotland not the second. The original cream paper was changed to white from April 1962 resulting in two variants of the ‘crowns’ watermark stamps. The postage stamp paper orders certainly helped to keep Stowford Mill busy in the mid-twentieth century. Three mill employees receive watches for 35 years’ service at Stowford Paper Mill from the Production Manager. Clyde “Clydo” Pawley (pictured far left) recalled working 16 hours a day for four months to make the paper for the Coronation stamps. On December 6, 1952, The Children’s Newspaper ran an article regarding an issue of British definitive postage stamps, known as the Wildings, since they featured a portrait of Queen Elizabeth II taken from a photograph by Dorothy Wilding. The Wildings were the first and only British stamps to feature graphite lines on the back, and the first to feature phosphor bands on the face, both aids to automation. The article makes reference to a small paper mill in Devon. The first postage stamps of Queen Elizabeth’s reign will be on sale in our post offices this Friday, December 5. They are the red 2½d. and the green 1½d., and Her Majesty recently paid a visit to the great printing works at High Wycombe, in Buckinghamshire, to see the first sheets bearing her portrait being run off the machines at a rate of more than two million stamps an hour. 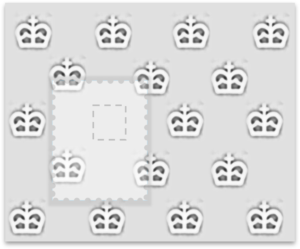 Stamps are printed on special watermarked paper called Royal Cypher paper. It is made from rags at a mill in Devonshire. Work continues there for 24 hours a day, and there is still an ancient watermill helping the modern steam turbines to turn the machinery. The rags are first chopped into small pieces, chemicals are added, and the mixture is boiled and churned into pulp. Then in goes china clay from Cornwall to give the paper a fine finished surface. The watery pulp, looking something like thin milk, is spread on a wire mesh belt and carried onto drying blankets passing over steam heated rollers. It is at this stage that the Royal Cypher watermark is impressed. The paper is then ready for despatch to the printers, where it is gummed. The gum is produced from Agava cactus plants of North Africa. We now use more than 7000 million postage stamps a year. Every working day 20 million must be printed, examined by expert girl checkers, and stored away in locked vaults ready for issue to the 24,000 post offices in this country to keep pace with public demand. Dorothy Wilding was a “society” photographer, renowned for her photographs of numerous celebrities during the 1920’s and 1930’s. She photographed King George VI and Queen Elizabeth at their coronation, and her photographs were used in the design of the 1937 Coronation Commemorative stamps. meaning: the collection and study of postage stamps. The word “philately” is derived from the French word “philatélie”, taking the Greek root word phil(o)-, meaning “an attraction or affinity for something”, and ateleia, meaning “exempt from duties and taxes“. The introduction of postage stamps meant that the receipt of letters was now free of charge, whereas before stamps it was normal for postal charges to be paid by the recipient of a letter. Individual watermarks suitable for a postage stamp needed to be both small and dense in coverage, to ensure that each stamp was at least partially watermarked. The dandy roll which created the watermark, carried thousands of separate electrotypes (watermark designs) soldered on to the mesh cover. During general use it was not uncommon for the odd one to become dislodged or even fall off. When left undetected, the result was a stamp collector’s dream, producing what is termed in philately circles, an ‘error’. This term was not isolated to missing watermarks, but included print errors, colour errors and perforation errors. By the late 1950s, the Post Office Supplies Department had new premises located at Hemel Hempstead from which all procurement of security items for public services was coordinated. This included the procurement of stamps, postal orders and national insurance stamps. Stock control and general security was of prime importance, given the value of these products. This filtered all the way down the supply chain. Stowford Mill was required to employ a full-time Security Officer to ensure every scrap of watermarked paper was accounted for, whether useable or broke (waste). At the Post Office depot, a system of double checking was enforced for every stage in the movement of stock. From 1968 onwards British stamps did not include a watermark. The issue of British Paintings was the first to be printed on plain (unwatermarked) paper, with Wiggins Teape taking the decision to transfer paper production to their Dartford Paper Mill. In 1925 Portals, owners of Stowford Paper Mill, were awarded the contract for the supply of postage stamp paper by the General Post Office. 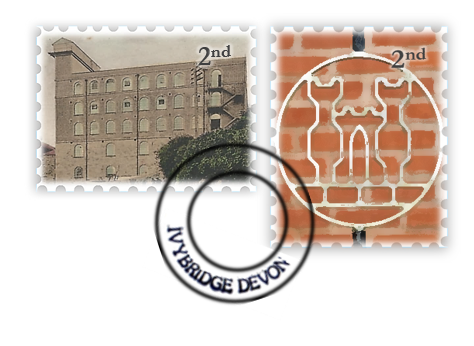 It seems from this date onward, two of their mills, Roughway Paper Mill and Stowford at Ivybridge, were active in the production of postage stamps.